The vehicles from the Halo universe are transport vehicles usually designed for use in combat situations. 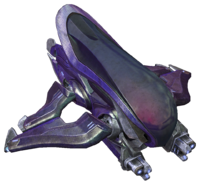 Many vehicles exist in the Halo universe, and some of them can be used in the Halo games. Vehicles are a very important part of the gameplay, and can be used in both Campaign and Multiplayer. Vehicles have distinct tactical advantages. Most vehicles have powerful weapons with unlimited ammunition. Their firepower can be used to damage or destroy enemy forces or placements. Vehicles can also be used to transport troops swiftly, and can provide essential support in skirmishes. Due to their size, vehicles cannot enter tight areas like buildings, where infantry can enter. Vehicles can be clearly seen and destroyed by enemy artillery or explosive small-arms fire. 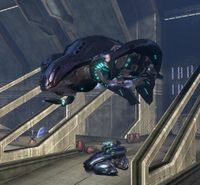 Since Halo 2, vehicles can also be hijacked, and if the boarder is successful, they can use the vehicle's weapons against the player. In gameplay, only a small number of very unique vehicles are controllable and usually operate in a similar fashion, allowing driving (navigation) or control of mounted weaponry (attack). Some vehicles allow one to do both simultaneously. The weapons usually have unlimited ammunition available, whether they are human (ballistic-based) or Covenant (plasma-based). When the player enters a vehicle by climbing into driving, weapons or passenger seats, the camera switches from a first-person to a third-person view. This improves peripheral vision and the bird's eye view makes it easier to drive around, with nearby terrain easily fitting into view. When the player has control of weaponry while being driven around in a vehicle, either hand-held weapons (usable while in passenger seats) or mounted weapons (usable while in turret seats), a stylized aiming reticle is displayed much like when in first-person view, locked to the center of the screen and replacing the typical arrow cursor. The player is allowed to use vehicles from either of the two primary factions, UNSC or Covenant, often turning the Covenant's usually superior firepower against itself. 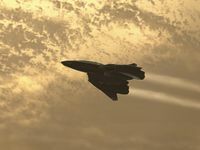 Playable human vehicles are typically grounded, and unable to fly. Almost every playable Covenant vehicle has the capability to overcome gravity to some degree, and hover or even fly around. Spacecraft and aircraft can be seen in cutscenes, though the player usually cannot control or affect them in any way. UNSC vehicles are usually named after animals (such as the Warthog or Pelican), while Covenant vehicles are mostly named after supernatural beings (such as the Ghost or Phantom); with the exception of large land units being named after insects (such as the Scarab or Locust). In Halo: CE, only the Ghost and Banshee can actually be destroyed. The gameplay mechanics involving vehicles have undergone a number of changes throughout the Halo games. For example, in Halo: Combat Evolved, a small prod or touch by a vehicle will instantly kill any infantry, including Hunters, whereas starting from Halo 2 the vehicle's speed and mass factor in on the amount of splatter damage. Starting from Halo 3, vehicles take collision damage when hitting other objects based on their mass and speed, and can destroy one another by ramming. The driver can also take damage when colliding with other objects, depending on the vehicle. UNSC and Covenant vehicles are made available in Campaign levels (depending on which side the player character is on, UNSC/Covenant), when the player needs to infiltrate or cut through enemy-held territory. Either kept unused, waiting for a driver or allowing the player's character (Master Chief, The Arbiter, The Elites, or the ODSTs.) to switch with a friendly unit, the player may enter it without meeting any resistance and take control of it. Alternatively the player may enter unoccupied mounted turrets. Boarding an enemy vehicle when near its rear or seating area. Cutting through its defenses by throwing frag grenades, sticking plasma grenades/spike grenades onto its armor plating or burning your way through with some fire bomb grenades. Killing the driver by melee attacks (available with any player character), or more grenades. Jumping down from the now disabled vehicle, which automatically grinds to a halt without its driver. Climbing into its driver seat as usual, since the fallen driver's body would have fallen out of the vehicle. This procedure may also be followed while in multiplayer gameplay, to take control of UNSC or Covenant vehicles controlled by members of opposing teams. Vehicles that have been stopped by sheer firepower by destroying or disabling them cannot be taken control of. With vehicles such as the Ghost and Banshee, the boarding procedure is simpler. You can board it, throw the driver off, and in most cases automatically assume control of the vehicle, all in one quick action. Certain vehicles can be driven in Multiplayer levels. Vehicles can be very useful in Slayer and Skirmish gametypes. In Capture the Flag, once the player character has picked up the flag, the character cannot drive a vehicle or take control of its weaponry, though the character may ride in a vehicle driven by another character. In the Halo universe five different types of vehicles exist. The first four consisting of ground vehicles: Light, Medium, Heavy, and Giant. The last type consists of all Aerial vehicles. Each have different strengths, weaknesses and purposes, which help to ultimately decide which vehicle to use in which situation. 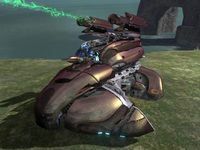 Some vehicles are unusable in the Halo games, but can be available for use with the use of modified game content. Light vehicles are usually used to travel for short distances along with fighting infantry units. They are agile and are usually equipped with small weaponry types. They usually carry up to four passengers. Some have light weaponry and armor which means they can be vulnerable to heavy weaponry, or leave the passengers and driver badly exposed to small arms fire. Ghost - Recon/Rapid Assault Vehicle. - Usable in every Halo game. Type-52 Prowler - Light Recon Vehicle. - Usable in Halo 3. Chopper - Rapid Assault Vehicle. - Usable in Halo 3, ODST, and Halo Wars and Halo Wars 2. Type-46 Spectre - Light Recon Vehicle. - Usable in Halo 2. Type-48 Revenant - Light Assault Gun Carriage. - Usable in Halo: Reach. AV-30 Kestrel Light Assault Vehicle. - Usable in Halo: Spartan Strike. M274 Mongoose ULATV - Ultra Light Recon Vehicle. - Usable in Halo 3, 4, ODST, Reach, and 2 Anniversary. M274-M Gungoose. - Usable in Halo 2 Anniversary. M12A1 Warthog LAAV - Light Anti-Armor Vehicle. - Usable in Halo PC. M12G1 Warthog LAAV - Light Anti-Armor Vehicle. - Usable in Halo 2, 3, 4, ODST, Halo Wars, Halo: Reach, Halo 2: Anniversary, Halo 5: Guardians and Halo Wars 2. M12R Warthog LAAV. - Light Anti-Aircraft Vehicle - Usable in Halo 4, and Halo: Reach and Halo 5: Guardians. M831 TT - Light Troop Transport Vehicle. - Usable in Halo 3 ODST, and Halo: Reach. Medium vehicles are a midway point between the recon prowess and agility of the light vehicles and the hard hitting power of heavy vehicles, without matching tanks in fire power. Medium vehicles will usually take more damage before destruction, and will provide better defense for the driver and passengers. They are usually larger than light vehicles, and will often carry heavy support weaponry. M9 Wolverine - Self Propelled Anti-Aircraft Artillery. - Usable in Halo Wars and Halo Wars 2. SP42 Cobra - Anti-Vehicle/Fortification Artillery. - Usable in Halo Wars. HRUNTING Mark III Cyclops - Bipedal Exoskeleton. - Usable in Halo Wars and Halo Wars 2. Heavy vehicles are designed to smash foes to pieces and crush the enemy beneath their treads. They usually feature powerful weapons and heavy armor for destroying enemy vehicles and protecting themselves from retribution. They are often slow and are often restricted by terrain. Wraith - Self Propelled Artillery. - Usable in Halo 2, 3,4,ODST, Halo Wars, Reach, Spartan Assault, 2 Anniversary, and Spartan Strike, Halo 5: Guardians and Halo Wars 2. Anti-Aircraft Wraith - Anti-Air version of the Wraith. - Usable through a glitch in Halo 3 and ODST, and officially in Halo: Spartan Assault, Halo: Spartan Strike and Halo 5: Guardians. Locust - Anti-building unit. - Usable in Halo Wars and Halo Wars 2. M808 and M808B Scorpion, M808S Scorpion and M820 Scorpion - Main Battle Tank. - Usable in Halo: CE, 2, 3, 4, ODST, Halo Wars, Reach, Spartan Assault, Halo 2: Anniversary, Halo: Spartan Strike, Halo 5: Guardians and Halo Wars 2. M850 Grizzly - An upgraded version of the Scorpion. - Usable in Halo Wars, Halo Spartan Assault, Halo: Spartan Strike and Halo Wars 2. M145D Rhino - Long range plasma tank. - Usable in two Halo Wars levels. HRUNTING/YGGDRASIL Mark IX Mantis - Bipedal "walker" available in Halo 4 and Halo 5: Guardians. The heaviest of vehicles that are designed for functions as big as their sizes. They are however rarely suited for proper combat situations. They will carry defenses, such as defensive gun emplacements and turrets, but will usually be vulnerable in heavy combat circumstances. Type-58 Harvester - Vehicle used for large scale excavations and searching for artifacts. - Appears in Halo 4. Type-55 Kraken - Vehicle used as an excavation walker but has been repurposed as a siege tower. - Appears in Halo 5. Elephant - Mobile command post/Search and Recovery/Personnel Transport - usable in Halo 3 (only on the multiplayer level "Sandtrap") and Halo Wars, though in Halo Wars it is a much smaller troop transport version and not the massive vehicle repair variant. The Elephant also appears during the levels Mombasa Streets and Coastal Highway of Halo 3: ODST as a garbage truck variant, the Olifant. M510 Mammoth - Heavy wheeled transport vehicle used by the UNSC. It is the largest known terrestrial armored fighting vehicle employed by the UNSC, dwarfing even the similar "Elephant" HRV in size. - Appears in Halo 4 and Halo 5: Guardians. Aerial vehicles are often designed for ground support purposes, but are equipped to defend themselves from other vehicles. Aerial vehicles usually only have two weapons - an anti-infantry based weapon, and a heavier type of weaponry, usually missile or rocket based. This is due to the vehicle often needing to be light to be air-worthy. Banshee - Covenant ground assault aircraft. - Usable in Halo: CE, 2, 3, ODST, 4, Halo Wars, and Halo: Reach, and Halo 2: Anniverary and Halo 5: Guardians. Heretic Banshee - The Heretic version of the Banshee. - Usable in Halo 2 and Halo 2 Anniversary. Lich - Massive Covenant troop transport/gunship. - Appears in Halo 4, Halo 5: Guardians and Halo Wars 2. Spirit - Covenant troop transport/gunship. - Appears in Halo: CE, Halo Wars, Halo: Reach, Halo: Spartan Assault, Halo: Spartan Strike, Halo 5: Guardians and Halo Wars 2. Phantom - Covenant troop transport/gunship. - Appears in Halo 2, 3, ODST,4, Reach, Spartan Assault, 2 Anniversary and Halo 5: Guardians. Vampire - Covenant atmospheric fighter. - Exclusive to Halo Wars. Type-31 Seraph - Covenant primary starfighter. - Appears in Halo 2, Halo 3, Halo: Reach, Halo 4, and Halo 2 Anniversary. Heron - Halo Wars unit used for building bases. Hornet - UNSC ground assault aircraft. - Usable in Halo 3, Halo Wars and Halo Wars 2. Transport Hornet - a Hornet without missiles and a slower machine gun. - Usable in the Halo 3 maps Avalanche and Sandbox. Pelican - UNSC troop transport aircraft. - Usable in Halo Wars and Halo 4, but ride-able and flippable through glitches in the Halo Trilogy. Sabre - Space fighter. - Usable in Halo: Reach. Shortsword - UNSC atmospheric bomber. - Usable in Halo Wars. Sparrowhawk (Hawk) - UNSC VTOL ground attack aircraft. - Usable in Halo Wars. Vulture - huge UNSC heavy gunship. - Usable in Halo Wars and Halo Wars 2. Human Supply Ship - UNSC dropship/supply transport. - Appears in Halo Wars. Condor - A UNSC long-range aerospace transport craft. - Appears in Halo Nightfall and usable in Halo Wars 2. SOEIV (Single Occupant Exoatmospere Insertion Vehicle) Primary drop-shock vehicle for ODST. - Appears in Halo 3 ODST and Halo 2. Wasp - A fast 1 man vehicle mainly used for air support. - Usable in Halo 5 Guardians. Phaeton - An attack vehicle. Great for dealing with swarms. - Usable in Halo 5 Guardians. Capri - a vehicle manufactured by AMG Transport Dynamics. AMG Civilian Warthog, aka "The Hog" - a civilian version of the military's Warthog. Usable in Halo 2 Anniversary. F-150 Sandcat - a pickup truck. HuCivGenet - a popular coupe, utilized by the NMPD as the standard model for their patrol cars. MagLev Train - an magnetically powered train seen in several human cities. Mainz Träger Dynamik - a Jeep-like vehicle. MLX - a luxury sports car. Pontiac GTO - an antique muscle car. Sinoviet HM 1220 LTUV-M - a former military vehicle-turned-civilian, similar to the warthog. S-2 Traxus Cargo Transporter - a forklift. Tractor unit - civilian and military cargo trucks. Überchassis - a luxury sports car.